32aam Adhyayam 23aam Vaakyam malayalam movie to be directed by Arjun Prabhakaran & Gokul Ramakrishan featuring Govind Padasurya in lead will go on floors by January 26 in Ernakulam. Miya George Lal, P. Balachandran, Sunil Sugatha and Shashi Kalinga will give life to other prominent characters. 32aam Adhyayam 23aam Vaakyam will be produced by Arun Nandanam under the banner Silver Owl Film Factory. The music department is handled by Govind Menon while Prasad Arumugam helms the camera. Govind Padmasoorya, the darling of Malayalam TV audience is gearing up to don the lead role in a suspense thriller helmed by director duo Arjun Prabhakaran & Gokul Ramakrishan. Titled '32aam Adhyayam 23aam Vaakyam', the movie will feature the young actor in two different looks. Miya George has also been roped to play the lead lady in the movie. Even though, Govind was offered with a lot of scripts in the past months, he was looking for a strong and interesting role as a hero. As wished to be a part of good films, Govind has been very cautious and choosy regarding taking lead roles. As the script of '32aam Adhyayam 23aam Vaakyam' had a soul, Govind decided to take up the project. The first half of the movie is set in the romantic mood which will transform into the suspense mood in the second half giving a thrilling experience to the viewers. Lal, P. Balachandran, Sunil Sugatha and Shashi Kalinga will give life to other prominent characters. 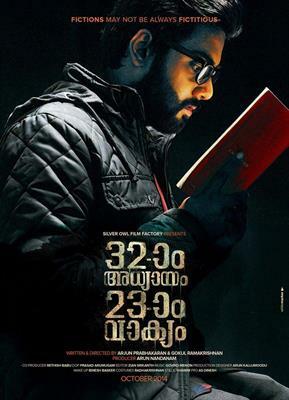 32aam Adhyayam 23aam Vaakyam will be produced by Arun Nandanam under the banner Silver Owl Film Factory. The music department will be safe in the hands of Govind Menon while Prasad Arumugam helms the camera. Earlier, Padmasoorya and Miya paired up for the movie '8-1/4 second'. '32aam Adhyayam 23aam Vaakyam' will go on floors by January 26 in Ernakulam. By the way, Govind has also committed a multilingual movie 'Hello Ajnabee' directed by Vinil Vasu. 'Hello Ajnabee' is a tragic love story of a couple who could not meet each other when they desired the most. Even though, Govind is known as a big screen actor, his popularity rose to the peak as the host of 'D4 Dance'. He is well liked by the small screen spectators for his witty anchoring and overall involvement in the show. Girls malayalam movie directed by Thulasidas featuring Iniya, Subhiksha, Arathi, Archana, Eden Kuriakose, Khaya, Sabitha Anand, Yuvarani, Sethulakshmi and Reshma has started rolling. Titled Ini Varum Nattkal in Tamil, the movie is touted as a horror thriller which will not feature a male character in any of its shots. Scripted by Manoj Shankar, the story of this women centric movie revolves around few docu-fiction technology students who set out on a journey. Appavum Veenjum malayalam movie directed by Vishwanathan featuring Ramya Krishnan in lead will start rolling very soon. Pratap Pothen and Sunny Wayne will give life to other prominent characters in the movie. Oseppachan will compose songs for 'Appavum Veenjum' while the movie is to be produced under the banner MTM productions. Wagamon and Kuttikkanam are the major shooting locations. Venugopal will handle the camera. Godse malayalam movie to be directed by debutante Shyju Govind featuring Vinay Forrt in lead will kick start from 15th January 2015. Touted as a black comedy, the movie inspired from TN Prakashan's short story Gandhimargam revolves around the life of Harishchandran, a dramatist. Godse narrates the social and political situation of the 90s. Aparna Nair plays a theatre student and will be seen in very interesting costumes. The movie will be canned at Thalasserry, Kozhikode and Thrissur. Happy Birthday malayalam movie to be directed by debutant Gautham Mohan featuring Asif Ali and Janani Iyer in lead will start rolling from March 2015. The story of the movie has been written by Rohit Panikker while Rajeev M Philip has penned the dialogues. Rohini, Vijay Menon, Nandu, Prathap Pothen and Jinu Joseph will give life to other prominent important characters. Prasanth Pillai is in charge of composing the music for the movie. Puluvan Mathayi malayalam movie to be directed by Saji Surendran features Anoop Menon in lead will start rolling from 1st April 2015. Anoop plays the title character of Mathew aka Puluvan Mathai, a protagonist who works in a horse stable in Dubai. Scripted by Krishna Poojappura, this big budget movie set in Dubai, Darjeeling and Kochi will mark the reunion of She Taxi team.